Learn more about how Vagrant allows you to easily manage and control multiple virtual machines. Vagrant allows you to easily manage and control multiple virtual machines. It is built on top of VirtualBox and VMWare and it provides many exciting capabilities. You can create isolated development environments, experiment with new products and technologies, install new versions of existing packages, create your own private data center on your laptop and run different operating systems. All that is available in an easy to manage and totally safe silo that can't interfere with your main activities and operating system. In this article I'll show you how to set up Vagrant and start exploring the wealth of opportunities it affords. After download, just run the binary and install it. Again, just run the binary to install it. Vagrant is a command-line based tool. Once installation is out of the way drop, into your command line prompt and create a new directory (I called mine 'playground'). 'vagrantup.com' for more information on using Vagrant. This will cause Vagrant to download a prepared virtual box with the 64-bit Ubuntu 14.04 (trusty) release. It will take a while and spit a bunch of mumbo jumbo to your screen, so let's take the time to discuss how to treat your VM. You may think about the VM as a completely separate server running somewhere. This is a totally valid view and it means that you will interact with the VM through a network interface. An alternative view is to consider it as a close neighbor with whom you want to exchange information. You will use a synced folder to read and write files on the VM as if they were local files. The fact that the VM really is located on the same machine helps the illusion as there is not a lot of latency as when dealing with a machine that is actually remote. You can, of course, use both synched folders and still SSH into your VM. There are other options that blur the borders such as port mapping. The syntax is Ruby, which gives you a lot of flexibility if you want to add conditionals and loops. This will launch an SSH session and let you fiddle with your VM interactively. Once, inside your VM you can pretty much do anything you want: run commands, create users, create files and directories, etc. You are logged in as the 'vagrant' user, which has sudo privileges, so you has full control over the VM. Vagrant automatically maps the folder on the host machine that contains the Vagrantfile to the /vagrant directory inside the guest machine. This lets you edit files in your favorite editor on the host machine and have it available in the guest or alternatively have the guest write some output file to the /vagrant directory and browse the synced folder on the host. Vagrant provides many commands to manage boxes. You can halt, resume, suspend, stop and even destroy a box. The reload command is good when you make changes to the Vagrantfile. You are always in control. The status command will give you a sense of the current state of your virtual machines (especially useful when managing multiple ones). The global-status command will show all the VMs including those defined in other directories in their own Vagrantfile. Vagrant gives you an easy to use computer within computer. You can manage a fleet of VMs for diverse purposes and the Vagrantfile is your interface for specifying how the VM should behave. 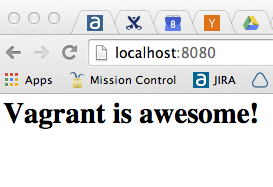 Have fun exploring Vagrant. I just scratched the surface here.